New Law On Jallikattu: Fraud To The People Or Panacea For Ancient Tradition? Jallikattu means an event involving bulls conducted with a view to follow tradition and culture on such days from the months of January to May of a calendar year and in such places, as may be notified by the Tamil Nadu Government, and includes "manjuviratu", "vadamadu" and erudhuvidumvizha". [Section 2 (dd) of the Prevention of Cruelty Act, 1960, after amended by the Prevention of Cruelty to Animals (Tamil Nadu Amendment) Ordinance, 2017]. One of the first known instances of Jallikattu in Indian history occurred between the 1st and 4th century BC. The controversy on this issue was disgorged from the time when the Hon’ble Supreme Court on 7.05.2014, in the case of “Animal Welfare Board Of India Vs A. Nagaraja & Ors in CIVIL APPEAL NO. 5387 OF 2014, (2014) 7 SCC 547” (Hereafter “AWBI Case, 2014”), struck down the Tamil Nadu Regulation of Jallikattu Act, 2009, while stopping the use of bulls on the eve of Jallikattu as repugnant to Sections 3, 11(1)(a) and 11(1)(m)(ii) of the PCA Act, 1960. Tamil Nadu, due to arising protest by its people in the state, has come with the new ordinance on Jallikattu i.e. Prevention of cruelty to Animals (Tamil Nadu Amendment) Ordinance, 2017. This new law on Jallikattu has given rise to many questions of law which are still unsolved in every corner where justice prevails or yet to be prevailed. The unsolved questions on the new law on Jallikattu can eminently be emanated as: Whether any law under Article 13 (3) of the Constitution of India in form of Act or Ordinance can override the effect of the judgment? Whether Prevention of cruelty to Animals (Tamil Nadu Amendment) Ordinance, 2017, has trenched the judicial power by overriding and taking away the basis of the law laid down by the Hon’ble Supreme Court in Animal Welfare Board Of India Vs A. Nagaraja & Ors in CIVIL APPEAL NO. 5387 OF 2014, (2014) 7 SCC 547? Whether unlisting bulls from performing animals’ list for the event of Jallikattu is not against the object of the PCA? And whether the Governor of Tamil Nadu had any power to make the Tamil Nadu Prevention of Cruelty to Animals (Conduct of Jallikattu) Rules, 2017, while considering the PCA Act, 1960, as the principal Act, without amending section 38 of the PCA Act, 1960, which still confers rule-making power only on the Central government? Parliament, in its 11th year of the Republic of India, enacted the Prevention of Cruelty to Animals Act, 1960 (hereafter PCA Act, 1960). The object of it was and has always been to prevent the infliction of unnecessary pain or suffering on animals and for that purpose to amend the law relating to the prevention of cruelty to animals. The Central government in 1962, while exercising its power under Section 4 of the Prevention of Cruelty to Animals Act, 1960, established the Animal Welfare Board of India (hereafter AWBI) for the promotion of animal welfare, in general, and for the purpose of protecting animals from being subjected to unnecessary pain or suffering, in particular. The Central Government in 1965, in exercise of the powers conferred by sub-section (2) of section 38 of the PCA Act, 1960, made the Prevention of Cruelty to Draught and Pack Animals Rules, 1965, where bulls were recognized as draught and pack animals. The Central Government again, in 2001, made the Prevention of Cruelty to Animals (Transportation of Animals on Foot) Rules, 2001, where Rule 11 specifically stated that no person shall use a whip or a stick in order to force the animal to walk or to hasten the pace of their walk. The Legislative Assembly of Tamil Nadu in 2009 enacted the Tamil Nadu Regulation of Jallikattu Act, 2009 (hereafter TNRJ Act, 2009), wherein the statement of objects and reasons specifically referred to maintain the ancient culture and tradition and to ensure the safety of animals, participants and the spectators. However, under the Act, the prime consideration was given to avoid injuries to spectators and by-standers, and not to animal. The Ministry of Environment and Forest issued a fresh notification dated 11.7.2011, specifically including ‘bulls’ also, so as to ban their exhibition or training as performing animals in every part of the country. The Hon’ble Supreme Court on 7.05.2014, in the case of Animal Welfare Board Of India Vs A. Nagaraja & Ors in civil appeal NO. 5387 OF 2014, (2014) 7 SCC 547” (hereafter AWBI case, 2014) struck down the TNRJ Act, 2009, as repugnant to the PCA Act, 1960, and held it unconstitutional while condemning the sport of Jallikattu and bullock cart race being violative of Sections 3, 11(1)(a) and 11(1)(m)(ii) of the PCA Act, 1960. Further, the 2011 notification of the Ministry of Environment and Forest was upheld. Further, the Ministry of Environment and Forest on 7.01.2016, issued a subsequent notification superseding its earlier notification dated 11.7.2011, thereby permitting the use of bulls as performing animals in events like Jallikattu and bullock cart races. The said notification of 2016 was also challenged before the Supreme Court, which is still in pending process. Meanwhile, the Governor of Tamil Nadu on January 21, 2017, promulgated the ordinance on Jallikattu (Tamil Nadu Ordinance No. 1 of 2017) which is named as Prevention of cruelty to Animals (Tamil Nadu Amendment) Ordinance, 2017, now the Prevention of Cruelty to Animals (Tamil Nadu Amendment) Act, 2017, which has been effective since 23.01.2017. The said ordinance was promulgated under Article 213 of the Constitution of India to amend the PCA Act, 1960, so as to preserve the cultural heritage of Tamil Nadu and to ensure the survival and wellbeing of the native breed of bulls. The said ordinance on Jallikattu has amended Section 2, Section 3, Section 11, Section 22 and Section 27 and added Section 28 A after Section 28 of the PCA Act, 1960 which provides that, “Nothing contained in this Act shall apply to ‘Jallikattu’ conducted to follow and promote tradition and culture and such conduct of Jallikattu shall not be an offence under this Act”. Furthermore, the Governor of Tamil Nadu on 21.01.2017, made the Tamil Nadu Prevention of Cruelty to Animals (Conduct of Jallikattu) Rules, 2017, under sub-section (2) of section 3 of the PCA Act, 1960 (Central Act 59 of 1960), as amended by the Prevention of Cruelty to Animals (Tamil Nadu Amendment) Ordinance, 2017 (Tamil Nadu Ordinance 1 of 2017). A question which may take a rise in the mind of the readers at this stage is that the Prevention Of Cruelty To Animals (Tamil Nadu Amendment) Ordinance 2017, nowhere provided the object of the ordinance to override the law laid down by the Supreme Court in AWBI case, 2014, then whether in these circumstances it can be against the judgment? The answer to this question was specifically addressed in the case of Madan Mohan Pathak v. Union of India & Ors. (1978) 2 SCC 50, Paragraph No. 31 and 32, where the Supreme Court held that even if the Act passed by Parliament specifically does not mention that the object of this Act is to take away the effect of the judgment, however, if it is implied from the section or preamble of the Act, it will be considered that the Act’s object is to take away the effect of the judgment and reversing it. Further, they held that even the basis of the judgment cannot be taken away in an indirect fashion. It is a well settled law that Parliament can neither directly overrides the effect of the judgment nor can take away the basis of the judgments decided. Legislature must pass the law retrospectively, which may alter the law as it stood when the decision or judgment was arrived at. The new law must cure the defect what was found by the court, while invalidating the old law. The Supreme Court in the case of ST Sadiq vs State Of Kerala & Ors, (2015) 4 SCC 400, in Page No. 412, Para No. 13 and 14 specifically observed that if the legislature wants to take away the effect of the judgment of the court then it must pass the law retrospectively, which may alter the law as it stood when the decision or judgment was arrived at. However, in the present case, it is axiomatic that the Prevention Of Cruelty To Animals (Tamil Nadu Amendment) Ordinance 2017, was not promulgated or passed retrospectively, but prospectively. Thus, in this way it does not fulfill the first condition as specifically expressed by the Supreme Court. The Supreme Court in the case of Shri Prithvi Cotton Mills Ltd. & Anr v. Broach Borough Municipality & Ors, (1969) 2 SCC 283, which was also referred in Para no. 20 of ST Sadiq v. State Of Kerala & Ors (2015) 4 SCC 400, held that if legislature wants to take away the effect of the judgment of the court, then the new law passed by it must cure the defect that was found by the court, while invalidating its old law. In the opinion of the author, the new law promulgated by the Governor of Tamil Nadu in form of Ordinance, which may be called “Act” in future i.e. Prevention Of Cruelty To Animals (Tamil Nadu Amendment) Ordinance 2017, has not cured the defect found by the Supreme Court in the case of AWBI case, 2014, while invalidating the old law, i.e. TNRJ Act, 2009. The new Ordinance on Jallikattu has made major changes in Section 3, Section 11, Section 22 and Section 22 and added Section 28A in the PCA Act, 1960. However, the changes in the said Sections can never modify the body structure of the bull. Bullocks still have a large abdomen and thorax and their entire body have a resemblance to a barrel shape, which limits ability to run. They cannot run until they get fear. Bullocks can be made to run with extreme care and caution. However, the new Ordinance on Jallikattu has not provided any care and caution to stop the cruelty on bulls. Though, the Governor of Tamil Nadu on 21.01.2017, made the Tamil Nadu Prevention of Cruelty to Animals (Conduct of Jallikattu) Rules, 2017, under sub-section (2) of section 3 of the PCA Act, 1960 (Central Act 59 of 1960), as amended by the Prevention of Cruelty to Animals (Tamil Nadu Amendment) Ordinance, 2017, which provide safety to bulls while conducting Jallikattu. However, these rules do not seem to be tenable in the eyes of law, since they have considered the PCA, 1960, as the principal Act. The author is not claiming that the State Government cannot pass any Act or make any rules for preventing the cruelty on animals since passing any Act or making any rules for the said subject matter is also a power of the State under entry No. 17 in the Concurrent List. However, if Tamil Nadu wanted to make any rules for the said subject matter, it could have either made changes in Section 38 of the PCA Act, 1960, or should have brought its own law without making the PCA Act, 1960, as its principal Act. Ergo, at this juncture, the present rules passed by the Governor of Tamil Nadu on Jallikattu are invalid and unconstitutional and cannot support its main ordinance. 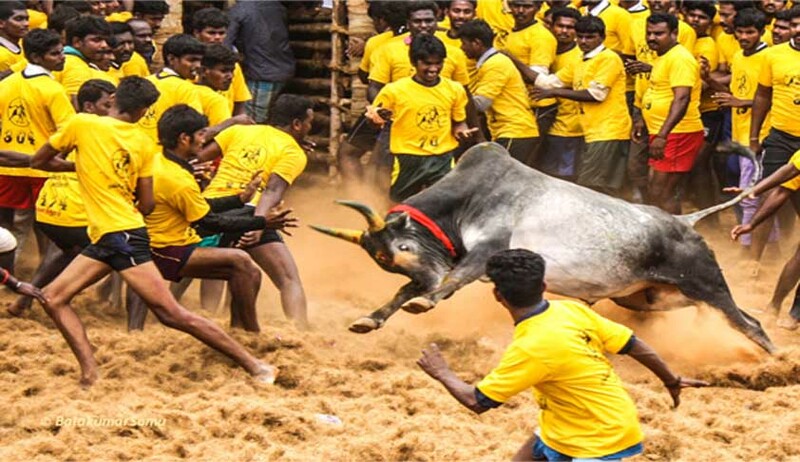 Further, in absence of the said rules on Jallikattu only, which provides safety to bulls, the said new ordinance has not cured the defect found by the Supreme Court in ABWI case, 2014. The statement of objects and reasons of the new Ordinance on Jallikattu still refers to preserve the cultural heritage of Tamil Nadu and has failed to state that it has any religious significance. Thus, even the new Ordinance on Jallikattu evinces its ancient culture and tradition, the PCA Act of 1960 being welfare legislation overshadows or overrides the so-called tradition and culture. In comparison to the TNRJ Act, the new Ordinance on Jallikattu refers only to ancient culture and tradition and to preserve the cultural heritage of the Tamil Nadu and to ensure the survival and wellbeing of the native breed of bulls. It nowhere provides the prevention of cruelty on bulls as its main objective. However, the new rules on conducting the Jallikattu do provide the safety to bulls but they cannot, at any stretch of imagination, be considered tenable in the eyes of law as discussed under defect No. 1. Thus, it will not be right to read the new rules on Jallikattu with the new ordinance. Therefore, making any types of changes in the PCA Act, 1960, without providing safety to the bulls and contrary to its main objectives is absolutely anathema to the Constitutional dictates engulfed under Article 21, Article 51A(g) and Article 254 (1) of the Constitution of India. After scanning the anatomy of the said defects and their cure thereof, it is vivid that the new law promulgated by the Governor of Tamil Nadu and the rules made thereof, have jettisoned the law laid down by the Supreme Court in the AWBI case, 2014. It is in the coming time to decide that whether the new laws passed by the Tamil Nadu Government is fraud to the Constitution of India or to the people of Tamil Nadu, or whether these are merely a trick to get rid of the sudden agitation spiraling out among the people or to provide them the permanent cure for the protection of their ancient tradition. Pawan Reley is an Advocate in the Supreme Court of India.